Do you remember jumping on your parents bed when you were really young? They probably told you that it was very dangerous and warned you not to ever do it, so you did it anyways! When things were off-limits because mom and dad said so, they became even more fun than they already were. It's not just kids who have a super awesome, fun time jumping around on the bed, dogs also love to mess around! 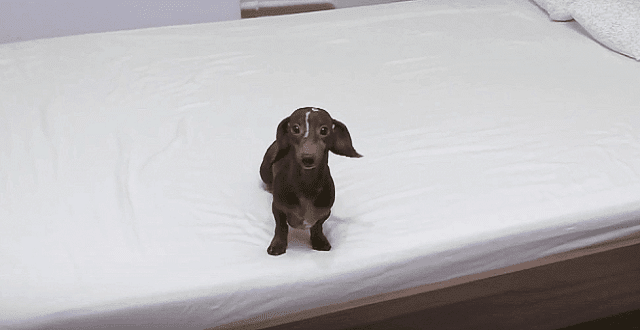 The little Dachshund puppy featured in this video is named Pepper and he's normally not allowed to go on his owner's bed. However, this time his human set up a hidden camera and captured his hilarious antics. The little cutie is a furry ball of energy as he zips around in circles across the bed. He gets completely carried away and the look on his face is priceless, you just have to see it for yourself! About halfway through the clip Pepper's fellow doggy friend Margo makes an appearance. She jumps up and joins him on the bed for some fun, taking her plushy raccoon along with her. The pair are sweet as can be and by the end of it all they're both completely tuckered out.